We spend a lot of our lives sleeping, but it's not something we often think about. Modern technology, with its circadian rhythm-derailing blue-light filled displays, can make it even more difficult to get a good night's sleep. The Sleepman, which is live on Kickstarter now for $99, could change that. It's a small device that attaches to your wrist via slap bracelet (seriously) and aims to improve your sleep via something called the E-Magnetic Enhancer. There are electrodermal activity (EDA) sensors that measure skin response metrics like galvanic skin response. It turns out that EDA will increase when you're in deep sleep, and subside during REM sleep. It combines these EDA sensors with heart rate and oxygen sensors to get a picture of your sleep – it doesn't track your movement with gyroscopes or accelerometers. Once it figures out how you're sleeping, it uses that E-Magnetic Enhancer to send out a current to your body, which Avantechs, the company behind the Sleepman, says improves your sleep. You don't actually feel the current flowing through your body, though, so this could be a little difficult to prove without actually trying it out or testing it in a lab. There's also an optional E-Magnetic Sleep Enhancer, which connects to the front of the Sleepman and gives you a self-adhesive electrode that attaches to your palm. Natalie Melomed, business analyst for Avantechs, says the Sleep Enhancer isn't mandatory for use, as it is an accessory, but is more of a signal amplifier that's good to have and suggested. Kickstarter backers will get this add-on for free. Once you're in the daily loop of wearing the Sleepman, the device will keep track of how you're doing and send you warnings when you're getting sleepy. If you need a nap during the day, you can activate Power Relaxation Mode, which the company says will send short impulses to your nervous system to help you fully relax and get to deeper sleep quicker. If you're looking to improve your sleep over the night, you can use Night Sleep Enhancement Mode, which uses algorithms to send the previously mentioned impulses in an effort to increase the amount of deep sleep you have during the night. You don't actually need to use this mode every night, as Melomed says the effect is "long lasting." Avantechs, a company that makes the aerodynamic-improving VorBlades for trucks and RVs, decided to make the Sleepman after discussions with drivers and companies in the transportation industry, says Melomed. 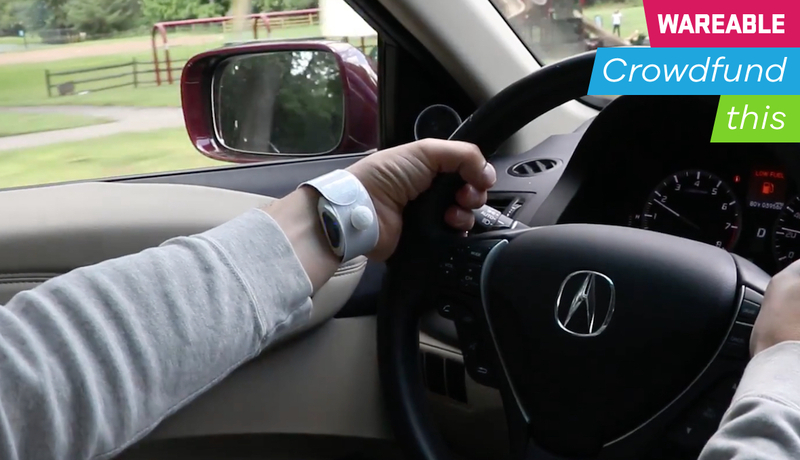 Fatigue is one of the leading causes of vehicle accidents, and Avantechs found drivers wanted something to improve their sleep quality while also waking them up in case they get drowsy. The Sleepman does both, as it will blink and make noises if you're about to fall asleep or lacking in quality rest. This iteration of the Sleepman is actually the second version of the device. The company had introduced an earlier model, which looks a lot more like a Samsung Gear Fit2 Pro than its current style. Melomed says the company received a lot of feedback about the design and features and decided to cancel the campaign to retool the device. "Our company name and reputation is at stake, so we definitely didn't want to collect funds and not be able to deliver what we promised," Melomed told us. "[Backers] were not looking for a watch, but again a device that would improve sleep and warn them when they're losing concentration and train them to sleep better." The new Sleepman solves those problems. It's not waterproof and comes with a much simpler slap bracelet rather than a traditional watch buckle. However, the company is also planning to announce a leather strap for those who don't want the slap bracelet – or want something a little more professional for work. That is the big question. One thing Avantechs definitely has going for it is that the startup been highly reactive to suggestions and comments from backers. While the original Sleepman was funded, it decided the comments from backers were interesting enough that it shut things down to rebuild the product. That leather strap? That was also taken from a comment on the Kickstarter campaign. Melomed stresses that the company's name and reputation is on the line if it doesn't ship the Sleepman, which it launched on Kickstarter both to get publicity and to break out from its transportation-industry bubble. "We wanted to get feedback from the general public that's not biased towards us as a company or biased toward a certain ideal," she says. If you're a driver – whether it be public transportation or trucking on freeways across the world – the Sleepman seems like a no-brainer. It's not too expensive at $99, and you'll even get an optional accessory that apparently improves its abilities for free. Fatigued driving is enough of an issue in the transportation industry that investing in a potential solution at that price seems like a safe bet. However, if you're just a regular person who is looking to improve their sleep – perhaps you're looking for something to get you away from your Fitbit Alta HR and its Sleep Stages – then it's a little difficult to whole-heartedly endorse the Sleepman, because while it all sounds good and wonderful, it's also good to wait and see whether those impulses actually help people sleep. The new Sleepman has already surpassed its goal on Kickstarter so it looks like we'll find out later this year whether it delivers on its sleep improving promise.